Preheat oven to 300°F. Prepare a baking sheet with aluminum foil, then coat with cooking spray. Melt butter in a large stockpot over medium-high heat. Stir in the brown sugar and corn syrup. Bring the mixture a rolling boil, then reduce the heat to medium-low and let simmer undisturbed for 4 minutes. Give the mixture a good stir, then continue simmering for 4 to 6 minutes, stirring every 30 seconds, until the mixture is an amber color. Turn off the heat and stir in salt, baking soda and vanilla until combined. 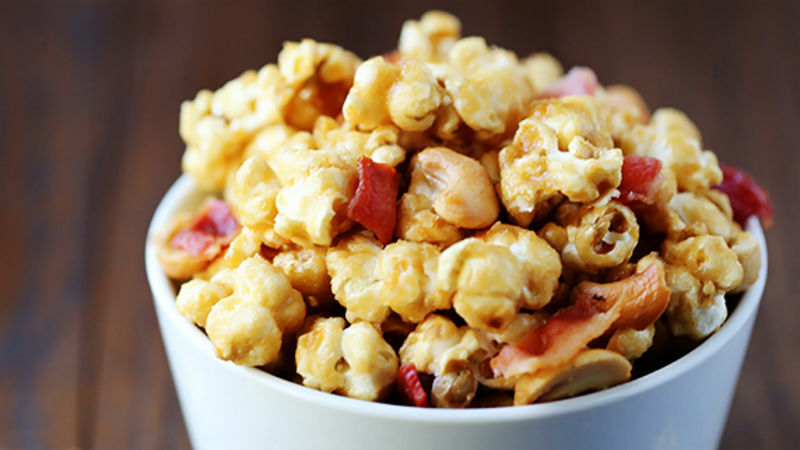 Gently stir in the popcorn, cashews and bacon until they are evenly coated by the caramel. Spread out the popcorn evenly on the baking sheet, then bake for 15-20 minutes, removing the sheet every 5 minutes to give the popcorn a good stir for even cooking. The ultimate sweet, salty and bacon-y popcorn – perfect to enjoy with your favorite awards show! Award show season is upon us, and I am so excited! Last weekend, a group of friends gathered to watch the Golden Globes. Of course, that must be followed by the Oscars. And then everyone has to watch the Grammy’s. And the music theater geek in me must watch the Tony’s. And the list goes on! I love a good awards show. But naturally, it must be accompanied by the most classic of classic show fare…popcorn! This year I decided to gussy up some classic homemade caramel corn with some cashews and popcorn. And oh my heavens, I’m pretty sure this one wins the award for “most irresistible”. Gotta love that sweet and salty combo! Begin with a big batch of homemade stovetop or air-popped popcorn. Then make your caramel sauce on the stove. It’s super easy to make, but be sure to keep an eye on it to be sure that it doesn’t burn. Then stir in the popcorn until it is all nice and coated. Then stir in the cashews and bacon. Spread out the mixture on an aluminum foil covered baking sheet. Then bake it for about 15-20 minutes until the caramel is cooked, taking it out to give it a good stir every 5 minutes or so. Then set it out to cool for 15-20 minutes, being sure to keep stirring it again every 5 minutes to break up clumps. Serve and enjoy it with your favorite show!